A big thank you from all of us at The Sharan Project for taking part in our annual fundraising event. The evening was a huge success on all fronts – it was a full house, our guests had great time and we raised money to continue to keep our lines open and help women in need. 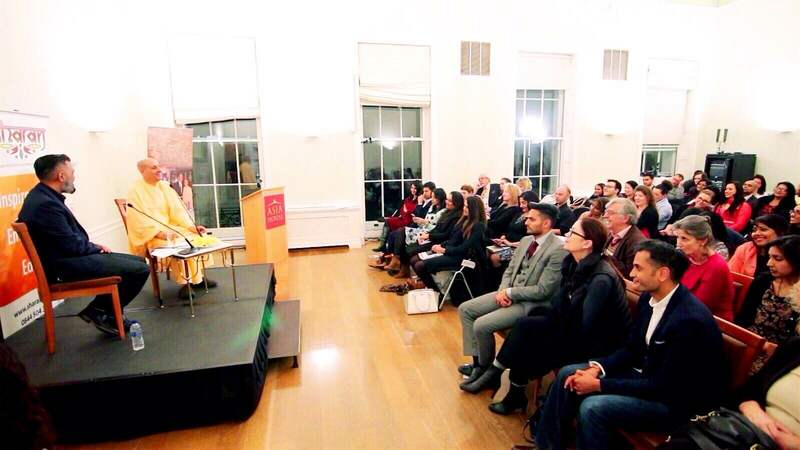 Our key speaker, His Holiness Radhanath Swami’s words of wisdom and inspiration moved many of us to tears. The renowned spiritual guru and author started his speech by recounting the exceptional story of Sindhutai Sapkal, a woman who went through abuse and extreme poverty and managed to turn her life around by helping other people. He then discussed the issue of love and compassion and how we need be connected with ourselves in order to love others and respect our differences. He also highlighted the importance of showing compassion, inspire and empower, as we all have a responsibility to care for others and for mother earth. A very engaging Q&A added new items of discussion, such as the role of spirituality in achieving love and compassion and how to conciliate the idea of karma with that of forgiveness. His Holiness pointed out that “holding grudges, even when they are justifiable, is not healthy. We should hate the disease, not the diseased”. Overall, his message was to love others and inspire them with our example. We would also like to thank Lady Gilda Levy, who opened the evening with a powerful speech on the importance of helping women to realise their full potential and to be what they want to be in a world where honour killings, forced marriage and disownment are still very much a reality. Lady Levy has given her contribution to the empowerment of women for many years through the Women’s Interfaith Network so it was an honour to have her speak at our event. And of course the evening would have not been such a success without our exceptional host, Sunny Grewal. 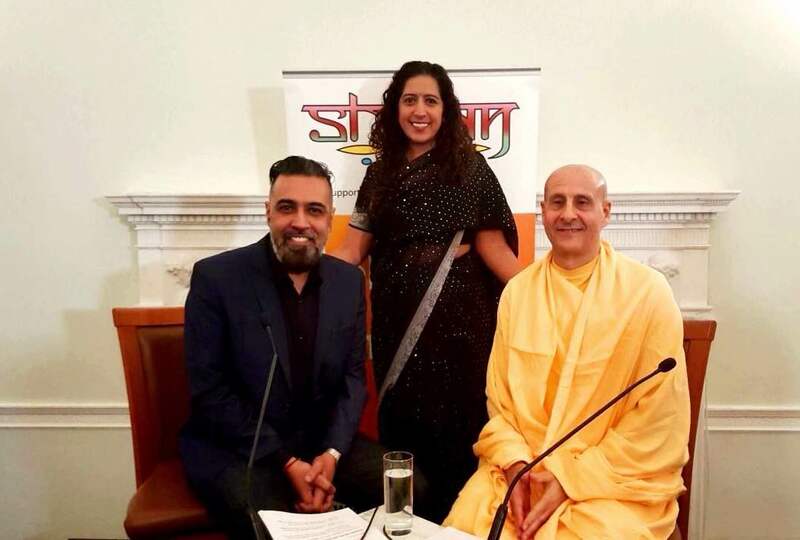 Best known as a BBC radio presenter alongside his wife Shay, he has often discussed honour abuse in his programmes and has been an ambassador for the Sharan Project for several years. At the event, he engaged in conversation with Radhanath Swami and then conducted the Q&A, with a superb mix of seriousness and humour. The evening concluded with some beautiful music by Project Asta as well as vegetarian food and refreshment, while His Holiness signed copies of his book, A Journey Home, which could be purchased at the venue. Also on sale during the evening was a beautiful teardrop pendant by Muuch’, representing the tears and strength of all the women we have helped. All the proceeds from the sale went to The Sharan Project. Once again, we would like to thank all our speakers, host, guests and of course our volunteers, without whom none of this would have been possible. We look forward to many more successful events like this in the New Year.